Photos by Brian John Bennett and published courtesy of the Aviation Museum of Ta` Qali. 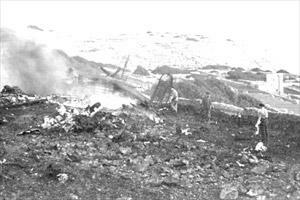 Today is the 50th anniversary of the crash of an RAF plane in the outskirts of Zurrieq. Michael Testa goes back in time to recall the tragedy that took the lives of 50 personnel and crew in their prime. Today, there is nothing on the site to commemorate the sad event. The four-engined Avro York aircraft, G-ANSY, chartered by the RAF from Scottish Airlines, was carrying British troops on their way from Suez in Egypt to the UK with a stopover in Malta. As the plane took off on Saturday, February 18, 1956 at 12.21 p.m., the air traffic controllers at Luqa airport saw smoke coming from one of the engines and informed the pilot, Captain Frank Coker. The plane appeared to climb to about 1,000 feet before going into a dive and crashing in the fields outside Zurrieq killing the 45 servicemen and five crew instantly. All those on board were RAF personnel except for one who was an army private who had requested permission to go to the UK because his father was ill. The bodies of the co-pilot, the navigator, the radio officer and an air hostess were taken to the UK for burial. All the others are buried in Mtarfa. In time, the crash site was cleared of all traces of the fierce fire that raged as 2,000 gallons of high octane aviation fuel spread over the crash site on impact. As the 50th anniversary was approaching, a correspondent wrote to The Times pointing out that apart from the memorial on the graves of the crash victims at the Commonwealth War Graves cemetery near Mtarfa, there is no other memorial, particularly on the site of the tragedy or close by, that marks the air disaster. Graham Read of Kidlington, UK, who at the time was doing his national service in Malta and has memories of the crash, went to the site when he visited the island last year and was surprised that there was no memorial of this large loss of life. He felt it would be opportune to mark this site in some way... "It would be nice to find some form of recognition of a sad day that happened 50 years ago". Another correspondent, Rosario Sammut, who was in the Royal Navy of Stubbington, Hants, wrote: "It would be a tribute to those who died on that day and a focus of remembrance to their families and friends". As a seven-year-old boy he remembers going up with other youngsters to the area known at Tal-Gibjun on the day of the crash. He recalls the fire fighters racing to the crash scene. Just past the water reservoir from where one can see Filfla in the distance, there was a path to the right leading to some fields. "A day or two later, like many people from the village, I revisited the area. I recall a section of damaged rubble wall and a small field all blackened, testimony to the fierce fire. Souvenir hunters were busy picking up the odd piece of cutlery from the charred soil." Mr Sammut, an ex-MT 1 (M) Royal Navy, also recalls the gruesome discovery of a hand of one of the victims. "By the side of a rubble wall a person was poking at something with a stick. It turned out to be a slender hand chopped at the wrist and obviously missed by the search party tasked with the retrieval of the unfortunate victims." The crash was the result of a combination of a mechanical fault in one of the four engines and human error, the Court of Inquiry, set up to investigate the causes and circumstances of the crash, had concluded. The aircraft, owned by Scottish Airlines (Prestwick) Ltd, was purchased from the Royal Air Force in 1954 and was put in service after being overhauled and converted by the company. According to the inquiry report, when the Avro York, which had arrived in Malta on the same day, took off from Luqa airport on its flight to Stansted, Capt. Coker, 40, of Prestwick, was cleared to turn right after take off. The actual take-off appeared to be perfectly normal. But moments later black smoke was seen to come out of the outer port engine No. 1. Instead of turning to starboard, as instructed by ground control, the plane drifted to port. The port wing later dipped steeply and the aircraft nose-dived into the ground near Zurrieq, straddling two fields and blowing up. All its occupants died instantly. The probable cause was failure of No. 1 engine due to cracks in the boost enrichment capsule which resulted in a fire. But, the report adds, this failure alone did not cause the accident. Another factor was loss of speed and consequent loss of control through an error of judgement - failure by the captain to stop the leftward swing of the aircraft using the rudder and to correct the nose high attitude and feather No. 1 engine. The altitude reached by the aircraft was sufficient for manoeuvring but the pilot failed to depress the nose of the aircraft in order to gain flying speed and directional control. The Court of Inquiry had kept in mind the possibility that Capt. Coker may not have feathered the propeller because he was still hoping to get some power from No. 1 engine, but it was considered that, in any case, he should have felt the drag on the rudder controls, particularly as the drag was being progressively accentuated by the diminishing directional control and by the ever-increasing approach to minimum control speed and stalling range. Moreover, the boost gauge should have indicated conclusively that no power was being derived from the faulty engine. "It should be added that, even if it were to be assumed that the pilot, for some unaccountable reason, had been unable to feather the propellor, the aircraft would still have been capable of a three-engine performance." According to the evidence before it, the court observed that although the captain had been trained in his routine emergency check test to take off with an engine failure, the test had been carried out not at the all-up weight of 68,000 lbs but at a lesser weight of 55,000 to 57,000 lbs. As the pilot received the message from local air traffic control that black smoke was coming out of No. 1 engine, at first there was no reply and as the call was repeated the aircraft immediately replied: "Stand by", meaning that the pilot was busy and was not ready to accept a message. No further communication was received form the aircraft. In its report, the Court of Inquiry said evidence confirmed that the aircraft climbed in steps at a slow forward speed, flying in a tail-down, nose up attitude and with varying degrees of smoke emanating from No. 1 engine. Shortly after passing over Qrendi village, the aircraft began to turn to port towards the southeast. At this point the aircraft was observed to be flying normally except that the engines seemed to have tremendous power and their vibration was felt by the driver of a car below. Shortly after, the Avro York was observed to falter in the air, its wings tilting both to port and starboard before finally dropping the port wing and turning over into a dive. It adds that from an inspection of the wreckage, it was determined that the aircraft was almost vertical at the time it struck the ground. All four engines had been torn from their mountings and on examination it was found that engines 2, 3 and 4 were functioning satisfactorily at the time of the crash. The Court of Inquiry also investigated the possibility of sabotage action but remarked that evidence in that direction was insufficient and consequently it was unable to conclude that the aircraft was subjected to any such action. Twelve of the RAF victims in the crash had won places on the aircraft in a "lucky draw" at their station in the Suez Canal zone. On February 20 of that year, The Times had reported that the father of one of the victims had received a letter from his son saying he was one of the lucky 12 personnel from his unit whose names had been drawn out of a hat to fly home rather than make the long trip by sea. Among the crew of the doomed Avro York were First Officer Robert Gorvin, 30, of Cowplain, Hants and air hostess Jill Upham of Chalfont St Peter, Bucks who were engaged and were to have been married some weeks later in Easter. Since its inception in 1917, the Commonwealth War Graves Commission has constructed 2,500 war cemeteries and plots, erecting headstones over graves and, in instances where the remains are missing, inscribing the names of the dead on permanent memorials. Over one million casualties are now commemorated at military and civil sites in some 150 countries, including Malta. It is a non-profit-making organisation that was founded by Sir Fabian Ware. The Commission's staff help enquirers locate a particular grave or a name on a memorial. Traces are carried out free of charge for relatives, but other enquirers have to pay a small fee for this service.